There are many methods for setting and achieving your goals, and here’s how to transition from the one you’re using to OKRs. What’s the relation between OKRs versus KPIs? Chances are that in some point of your life you have used some kind of Key Performance Indicators. With OKRs there are Key Results and that can be confusing. Don’t worry they are almost exactly the same thing. So, if you have used KPI’s you already have a upper hand in using key results. The Key Result portion of the OKR is a measurement that supports the Objective. Therefore, the Key Result actually incorporates the KPI. In other words, everyone who uses OKRs is also automatically using KPIs. What’s PPP – Plans, Progress, Problems? Problems. What problems are you facing? (Present). Each week employees answer these questions (without writing long essays) and a manager can get an overview of what’s going on. The Matrix is a 4-square grid. The top 2 boxes are respectively labeled Urgent and Not Urgent at the top. The top row is labeled Important to the left, and the bottom row is labeled Not Important. 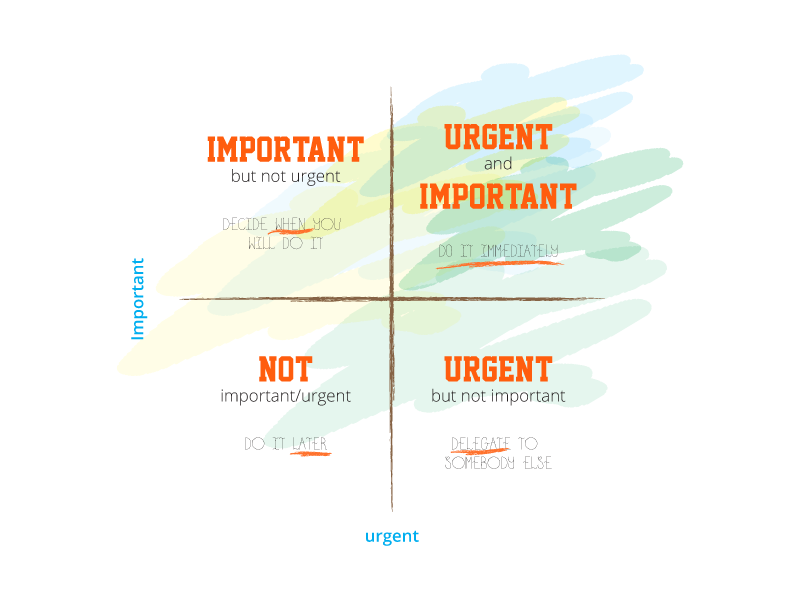 The Eisenhower matrix expedites time management. You list all the tasks for your day in one or another of the boxes. As you list them in the box, do so by priority. When finished, address the Urgent/Important Tasks immediately and dismiss the Not Urgent/Not Important tasks. Once you’ve gotten comfortable and have decided on the tool to manage your OKRs it’s time to transfer them over and import them. The classic way to do this is through copying and pasting your objectives from spreadsheets into the tool. You can also read a detailed guide about moving from spreadsheets to Weekdone. What’s the relation between OKRs and S.M.A.R.T? Achievable – when planning, there’s no point in deciding to fulfill all dreams in a year. Make sure you think what you really could do. SMART methodology is often used when setting Objectives as it makes sure your objectives are well thought out and focused enough. OKRs work best if KR performance is measured regularly. You can use a combination of weekly status reporting and OKRs by linking each weekly task to a KR. If a weekly task can not be linked to a KR, you need to think long and hard if the task is necessary to achieve your goals. You can use the Eisenhower Matrix for your goal setting. The Matrix is a 4-square grid. The top 2 boxes are respectively labeled Urgent and Not Urgent at the top. The top row is labeled Important to the left, and the bottom row is labeled Not Important. You list all your goals in one or another of the boxes. As you list them in the box, do so by priority. When finished, address the Urgent/Important Goals immediately and dismiss the Not Urgent/Not Important tasks. Is an answer missing from Transition from other goal-setting methods? Ask our OKR experts any question about Transition from other goal-setting methods.